2017: 2017 Recipient of the UIA Jean Tschumi Prize for Excellence in Architectural Education and Criticism, International Union of Architects, Paris, France. 2015: Invited Visiting Professor, Distinguished Visitor Program: Center for Sustainable Development at the University of Central Lancashire, Preston, UK. Involved a number of contributions over the week visiting period including a Public Lecture: Researching the Global South: Contemporary Research Trends in Architecture and Urbanism. 2014-2016: Invited Visiting Professor, HBKU: Hamad Bin Khalifa University, Doha, Qatar. Delivered Graduate class on Cultural Factors in Urbanism and Crticism and Assessment in Architecture, and a Public Lecture in April 2015 entitled 100 Years of Architectural and Urban Traditions in the Arabian Peninsula: Towards Comprehensive Research Frameworks. 2009: Fellow: Fellowship Award—Certificate of Recognition, Higher Education Academy, “Recognition of Expertise and Commitment to Enhancing and Supporting the Student Learning Experience in Higher Education, York, United Kingdom. 2009: Fellow: Royal Society of the Arts—the RSA, London, United Kingdom. 2005: Certificate of Award, CEFPI, Council of Educational Facilities Planners International, Contribution to the Ideals set forth by the Council. CEFPI, Scottsdale, Arizona, USA. 2002: Appreciation Award- La Paz City Mayor, Bolivia, Contributing Jury Member and Reviewer in Inner City Re-development Program. La Paz, Bolivia. 2000: Achievement Award- Institute of International Education, Sustainable Tourism Program. 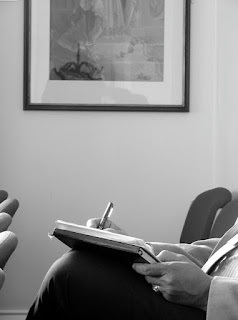 USAID, Washington, DC. USA. 1999: Appreciation Award-Lleida City Council, Spain, Contribution in the International Program of Intermediate Cities. Lleida, Spain. 1998: Paul Chemetove Prize, International Ideas Competition, Architecture and the Eradication of Poverty, International Union of Architects/UNESCO, Paris, France. 1995: Outstanding Teaching and Research Award, Community Development Group, School of Architecture, College of Design, North Carolina State University, USA. 1993: Channel Exchange Ph.D. Research Fellowship to the United States, Egyptian Ministry of Education, Cairo, Egypt. 1990: First Prize of the International Architecture Design Studio, Canada, School of Architecture, University of Montreal, Montreal, Canada. 1987: Outstanding Academic Performance, Award of Excellence of Graduation Design Thesis, Society of Egyptian Architects, Cairo, Egypt. 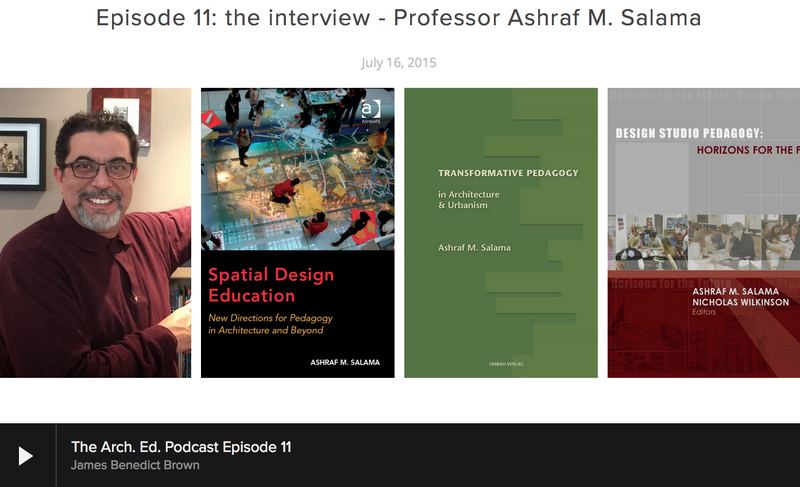 2015: Interview with A. M. Salama by Dr James Benedict Brown on Experience and Work on Architectural Pedagogy Over Two Decades, ARCH.ED.PODCAST, Online, Norwich, United Kingdom (July 16, 2015). 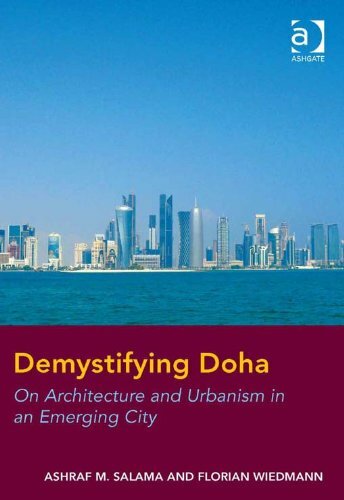 2013: Interview with A. M. Salama by Rubina Singh, titled: Globalization is translating the vision of Doha, Gulf Times,Doha, Qatar, Daily Newspaper, (April 19, 2013). 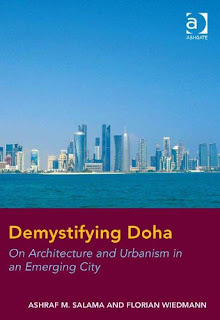 2012: Interview with A. M. Salama, by Emily Alp, titled: Towards a More Conscious Approach to Urban Development, published in QNRF Newsletter, Bloomsbury Qatar Foundation Journals, Issue 8, Online (January, 2012). 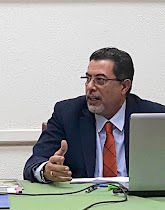 2004: Interview with A. M. Salama by Craig Miller titled: Selling Sustainability: Interviews with Experts and Consultants, published in Facilities Design and Management Magazine, VNU Business Media, New York, New York, Volume 22, Issue 2 (February 17, 2004). 2003: Interview with A. M. Salama by Brian Johnson, titled: Supporters Tout New Buildings Design Standards, published in Finance and Commerce, Minnesota Business Journal, Dolan Media: Minneapolis, Minnesota, Volume 116, Issue 86 (April 17, 2003). 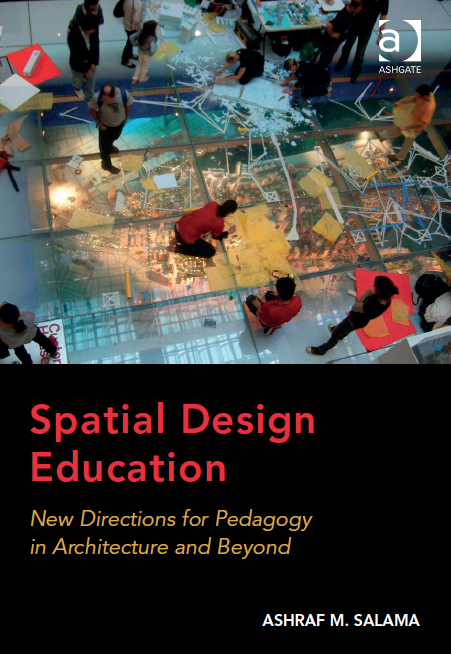 2015: Review Statements and Endorsements of“Spatial Design Education: New Directions for Pedagogy in Architecture and Beyond,” Ashraf M. Salama, Ashgate Publishing Ltd (Routledge New Edition), by Halina Dunin-Woyseth (Oslo School of Architecture, Norway), Tammy Gaber (Laurentian University School of Architecture, Canada), Michael J. Crosbie (University of Hartford, USA), Jeff Hou (University of Washington, USA), Karen Keddy (Ball State University, USA), Harriet Harris (Oxford Brookes University, UK), Jeffrey Haase (The Ohio State University, USA). 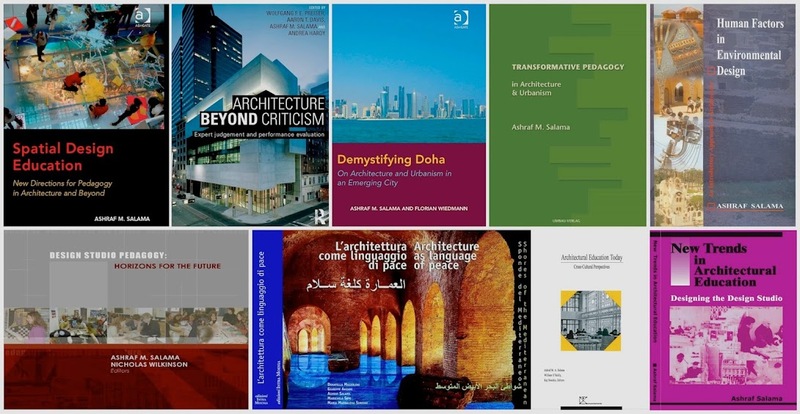 2013: Review Statements and Endorsements of“Demystifying Doha: On Architecture and Urbanism in an Emerging City,” Ashraf M. Salama and Florian Wiedmann, Ashgate Publishing Ltd (Routledge New Edition), by Henry Sanoff (Emeritus Professor, North Carolina State University, USA), Albert Speer (Albert Speer and; Partners GmbH, Germany), and Attilio Petruccioli (Head of Bari Polytechnic School of Architecture, Italy), Ashgate Publishing Website. 2011: Review of “Transformative Pedagogy in Architecture and Urbanism, Ashraf M. Salama, Umbau-Verlag, by Smita Khan (VNIT, Nagpur, India), in ArchNet-IJAR: International Journal of Architectural Research, vol. 5, issue 1, PP. 170-174. 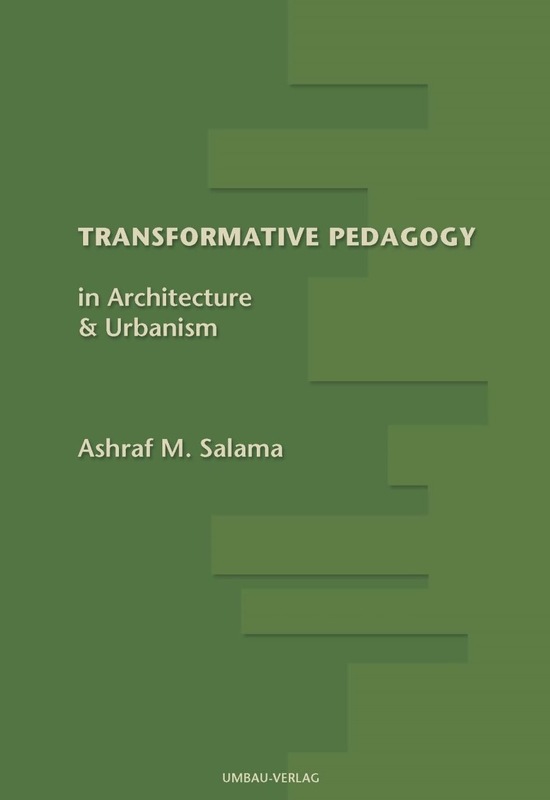 2011: Review of “Transformative Pedagogy in Architecture and Urbanism, Ashraf M. Salama, Umbau-Verlag, by Amira Elnokaly (Lincoln School of Architecture, UK), in ArchNet-IJAR: International Journal of Architectural Research, vol. 4, issues 2-3, PP. 467-470. 2009: Review Statements and Endorsements of “Transformative Pedagogy in Architecture and Urbanism,” Ashraf M. Salama, Umbau-Verlag, by Henry Sanoff (Emeritus Professor, North Carolina State University, USA) and Nikos Salingaros (Urban Theorist, University of Texas-San Antonio, USA), in the book preface, foreword, and back cover. 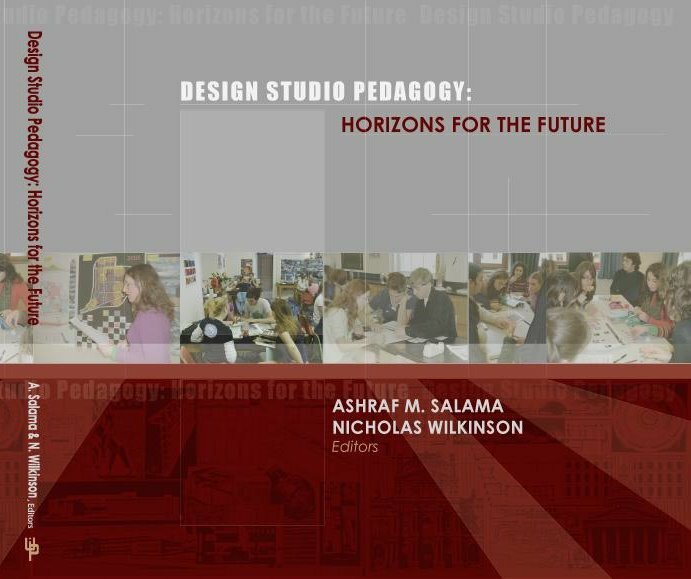 2008: Review of “Design Studio Pedagogy: Horizons for the Future,” Ashraf M. Salama, Nicholas Wilkinson (eds. ), Urban International Press, Gateshead, United Kingdom, by Nikos Salingaros (Urban Theorist, University of Texas-San Antonio, USA), in Open House International, Volume 33, Issue 1, PP.86-88. Hartford, USA), in Open House International, Volume 32, Issue 3, PP.90-91. 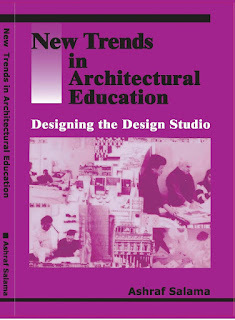 2007: Review of “Design Studio Pedagogy:Horizons for the Future,” Ashraf M. Salama, Nicholas Wilkinson (eds. ), Urban International Press, Gateshead, United Kingdom, by Halina Dunin Woyseth (Professor of Architecture, Oslo School of Architecture, Norway), in Archnet-IJAR: International Journal of Architectural Research, Volume 1, Issue 3, PP.194-206. 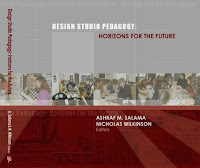 2007: Review of “Design Studio Pedagogy:Horizons for the Future,” Ashraf M. Salama, Nicholas Wilkinson (eds. ), Urban International Press, Gateshead, United Kingdom, by Julia W. Robinson (Professor of Architecture, University of Minnesota, USA), in Archnet-IJAR: International Journal of Architectural Research, Volume 1, Issue 3, PP.206-207. 2007: Review of “Design Studio Pedagogy:Horizons for the Future,” Ashraf M. Salama, Nicholas Wilkinson (eds. 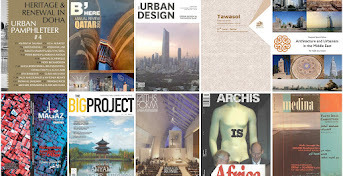 ), Urban International Press, Gateshead, United Kingdom, by Michael J. Crosbie (Professor of Architecture, University of Hartford, USA), in Archnet-IJAR: International Journal of Architectural Research, Volume 1, Issue 2, PP.106--108. 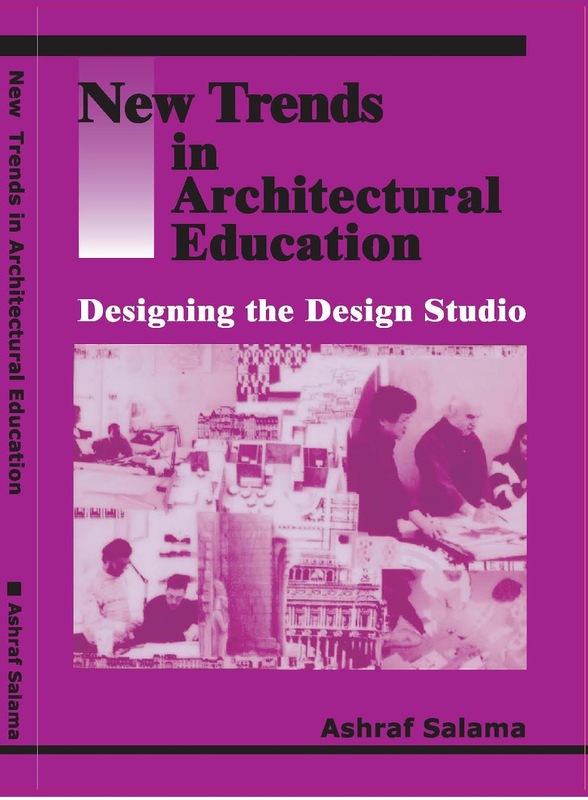 1995: Review Statements and Endorsements of “New Trends in Architectural Education: Designing the Design Studio,” Ashraf M.Salama, by Jon T. Lang (Emeritus Professor, University of New South Wales, Australia).